I used to love strategy RPGs but as age has warped my enthusiasm so has it stolen my patience for all the genre’s clutter, meandering UI constructs, same-y production values, punishingly difficult fights, and oftentimes tedious leveling systems. The Game Bakers’ Squids [99¢] is a great change of pace. It’s a kinetic, clean, charming, and particularly streamlined entry in an aging genre that has a ton of character, fun, and unique constructs to share. I’m not particularly turned on by its free-to-play functionality, but it’s an otherwise solid game. Squids‘ setup goes a little something like this: in a troublesome period of squid life, you’ll be tasked with stopping an evil black ooze that threatens to destroy civilization with its ooziness. To accomplish this great deed, you’ll need to assemble a team of eclectic and multiple-armed things, all with different abilities and varying degrees of awesome, and take the fight to the core of the conflict. There are four classes in total – the scout, the healer, the brawler-dude, and the gun-guy who can hit enemies at massive range. It’s a pretty uninspired setup saved by Squids’ inventive, grid-less, and active combat mechanic. Instead of moving space by space, you’ll be flinging your squids into enemies and areas of interest in the environment that contain goodies. When you connect with a foe, you’ll do damage according to a bottom-line. A stamina bar keeps you from endlessly flinging around the map to and fro and allows for turns. Enemies do the same. Combat manages to remain consistently interesting throughout the experience, as the maps have a ton of surface area and even the more modest flings cover a lot of ground. Positioning your characters takes as much style and touch as it does thought, and you’ve got an entire map to work with, as opposed to constricted and designated kill zones featured in other similar games. 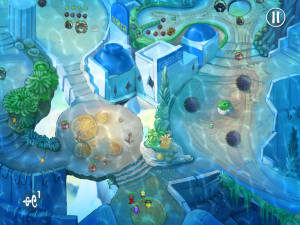 You’ll also need to contend with the lack of level borders. Squids is fond of holes as much as it is of its pinball-like physics engine. When you make contact with an enemy, there are physical repercussions as the two (or more) of you spin off. Knocking foes off the ledge-less levels is a valid play strategy, but same goes for the enemies. All blended together, Squid’s combat ends up being delightfully action-heavy, while still remaining a strategy game at its core. Individual fights never dance with monotony because you’re always moving around the breadth of a map, frantically avoiding edges and attempting to position yourself for rounds that’ll hopefully swing in your favor. 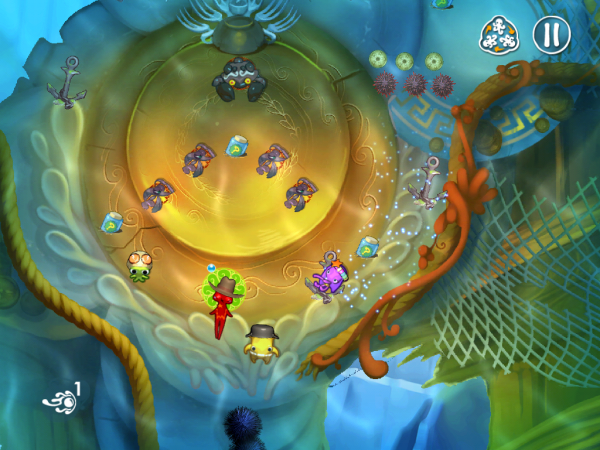 The level design in particular is huge for the combat: Squids boasts a ton of colorful and intricate environments with not-so-subtle zones you can “capture” and control, as well as traps you can exploit. Keeping true with conventions, invisible dice-rolls and statistics provide the groundwork for the damage dealt and taken. The currency for leveling up is the pearl, which you’ll receive for every downed opponent and find scattered around in the game’s world. This currency rubs me the wrong way: it’s monetized and the balance of the late game kinda reflects that. At some point, you’ll probably be aching for levels, items, and characters in exchange for pearls and I feel like the only reasonable way to get them outside of tedious backtracking methods is by spending real-world coin on the fake-world currency. It’s a weird, out-of-place value proposition that really bummed me out on an otherwise sharp experience. While Squids might suffer for its off-kilter payment model, it doesn’t make any sacrifices on the visual front. It’s a delicious, warmly crafted game that has an indescribable charm and whimsy that springs from its painterly look. It’s gorgeous, and all of its constituent parts, including the animations, the cutesy writing, and the sound production, support its style and tone spectacularly well. It’s an impressive feat. The strategy RPG is, like, my arch-nemesis. I want them until I actually play them and start remembering why I dislike them while wading through their overbearing setups. Squids is remarkable in that it cooly throws out a lot of the garbage I associate with the genre and turns it on its head with a kinetic combat mechanic that keeps you in control without sacrificing any strategy. If it wasn’t for a wonky layer of in-app currency, I’d be screaming about its greatness. Instead, I can only tell that it’s definitely a good game with a fresh approach, but it’s a little rough around the RPG edges. I think you’ll like it, though, model be darned. Next PostNext ‘Super Cyclone’ Review – Destroy the Alien Nests!